Down 28 riders after 2 weeks of racing, the 2011 Tour de France continues into week three with 170 riders racing towards Italy (first!) and then into the French Alps and on to Paris. List of Riders and Withdrawals. Vino has emotionally retired from cycling. The remaining riders are rested and ready, but quite wet after the heavy rain this morning. There is much talk about bad weather in the Alps, and how that could affect the race. Yesterday there was snow on the Galibier (and a rescue of cyclists). 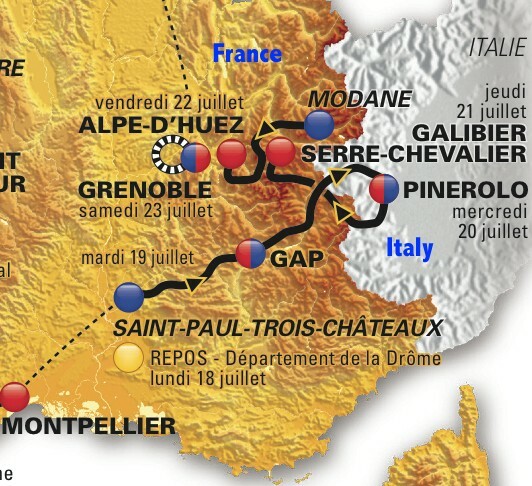 Anything could happen this week in the Tour de France. Live link online to watch Stage 16 Tour de France on Eurosport (x out both ads, no need to download). Watching the time gaps Gaps on LeTour website and live report CyclingNews live reports. It was fun reading about yesterday's rest day through the tweets of the riders at the Tour de France. The major themes of their day off in Département de la Drôme were good hotels, great food and better wine. Makes me want to go to France! I especially enjoy following @laurendtendam, @Mark_Renashaw, and the Fabianese at @F_Cancellara, also @MattRabin and so many of the others at the TDF this year.